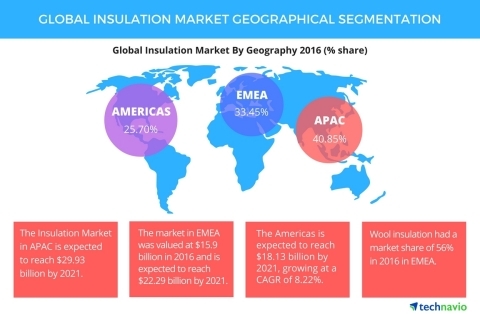 The global insulation market is expected to grow at a CAGR of over 8% during the forecast period, according to Technavio’s latest report. In this report, Technavio covers the market outlook and growth prospects of the global insulation market for 2017-2021. By product type, this market is segmented into wood insulation and plastic foam insulation. The growing need for energy efficient buildings is one of the most important drivers of the global insulation market. Commercial and residential buildings employ several temperature regulation systems, and it is important to ensure that there is no energy leakage to make efficient use of these systems. “High rates of urbanization and industrialization is creating an increasing requirement for energy. To ensure optimal utilization of the available energy, residential and commercial end-users in the region are making use of insulation systems. The energy efficiency provided by insulation systems will drive the market growth in APAC,” says Bharath Kanniappan, one of the lead analysts at Technavio for automation research. By product type, expanded polystyrene accounts for the highest share amongst insulation materials used in the region. Additionally, the growing awareness about fire insulation in APAC is expected to provide an additional push to the growth momentum in countries like China, Japan, and South Korea. Glass wool and fiberglass insulation materials are the most popular insulation materials in EMEA. Western Europe comprises the biggest market for insulation with countries such as the UK, Germany, France, Spain, and Italy, responsible for generating the highest revenue. The energy efficiency norms in EU, and the Passivhaus standard are the major factors that are influencing the market. In Europe, the construction industry is driving the need for insulation in buildings. Additionally, vendors are just tapping the potential of the insulation market in the Middle East, which is expected to showcase fast growth. “Retrofitting activities in both residential and non-residential sectors will be the major revenue contributor in North America. Continual focus on optimizing energy consumption and lowering operations and maintenance costs is expected to provide momentum to the insulation market in the US and Canada,” says Bharath. Fiberglass insulation is the most popular insulation product in the US. Among the South American countries, Brazil will emerge as the highest contributor for insulation vendors, owing to the growing awareness about energy conservation and the trend of obtaining LEED-certification for buildings. The climatic conditions in South American countries are typically wet and humid, which demonstrates a latent potential that the vendors are beginning to capitalize.